Paris Notre Dame Cathedral’s character changed as it was being built. In the process, it became one of the world’s great buildings. 1. 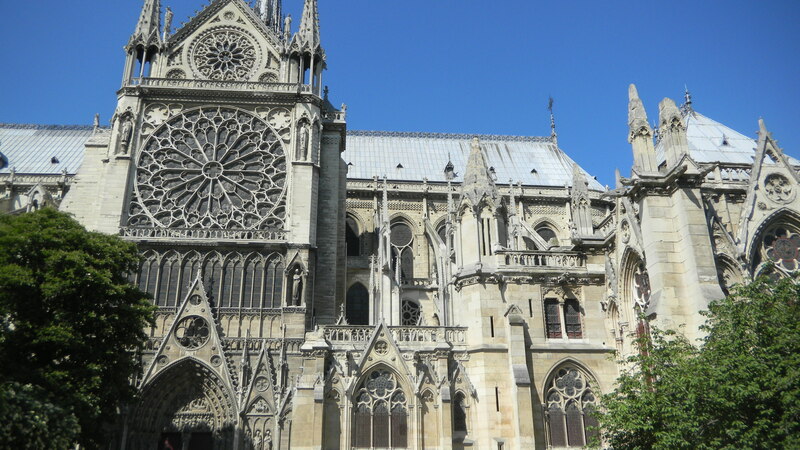 Paris Notre Dame Cathedral is the first monumental building with flying buttresses–many of the ones you see today (and in the above photo) are 19th century reconstructions. They were invented in the 1180’s. Before then, builders relied on thick walls and hidden buttresses. 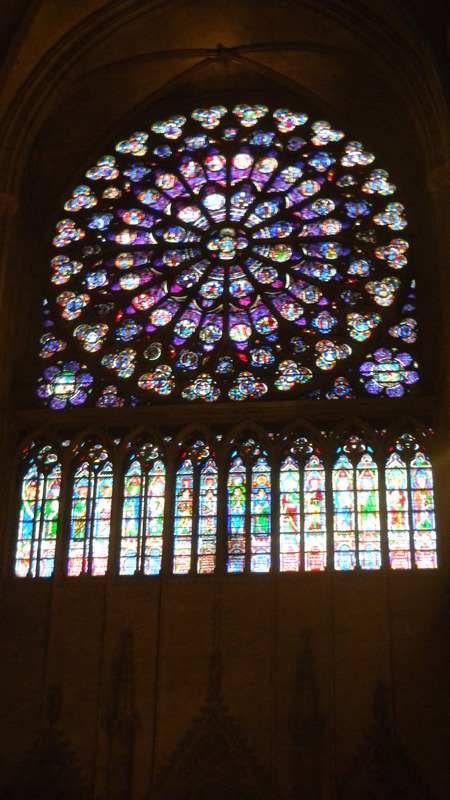 But Notre Dame’s master made the buttresses visible, and they became a major feature of the great Gothic cathedrals that followed, like Chartres. They changed the look of the nave from a hulking mass to a forest of arches and spires that seem to embody the soul’s rise to Heaven. 2. A new master came from Chartres and he finished the nave. Cathedrals were constructed from the eastern end, where the choir is. He began Notre Dame’s majestic west facade (its main entrance) around 1200. 3. France’s king from 1200 to 1223, Philip Augustus , led his army into Normandy in 1204 and captured the main stronghold of the English in France, Chateau Gaillard. The bulldog knights were now in retreat. Philip was bent on centralizing and building the monarchy. Paris Notre Dame Cathedral was becoming a perfect statement about the glory of France and its crown. 4. In 1220, the base of the west facade’s gallery of kings was finished. The French monarchy now had a place in God’s sacred order. You can see the big guys presiding above the arches over the 3 entrances in the above shot. 5. 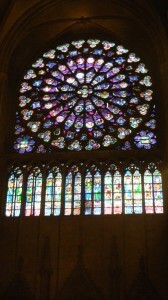 In 1225 the rose window was finished, and the towers were completed in the 1240’s. 6. 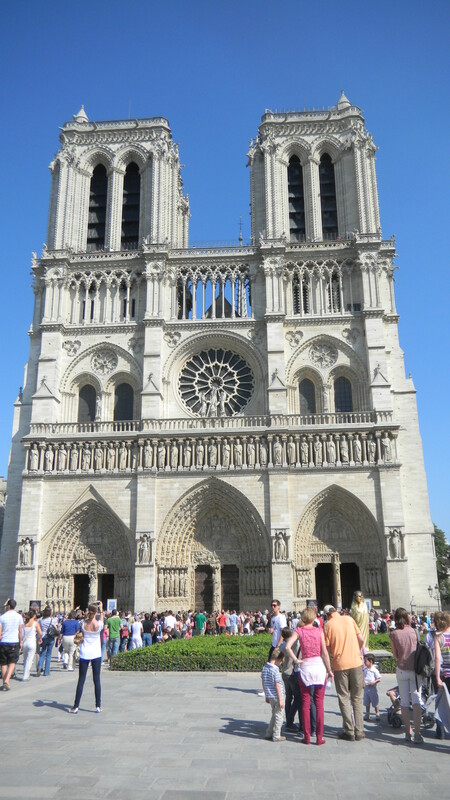 With the towers, Notre Dame’s facade becomes a square and a half. It has a geometrical logic. 7. The facade’s vertical and horizontal features balance each other within this outer form. All features are logically related. Universities, which had emerged in cities in the 12th century, were teaching scholastic philosophy, which says that everything in the universe has its place in God’s order of things. So the sheer size which Notre Dame’s designer went for in 1160 became more sophisticated by the 1240’s–it now reflected an urbane world of academics and merchants who were literate and analytical. 8. The square and a half which frames these interrelationships balances earthly dominion (the horizontal dimension) and sacredness (the vertical). Notre Dame doesn’t take flight like Chartres Cathedral seems to. It stands firmly on the earth. The fusion of royal power and sacredness seems like the permanent order of things. 9. At least it did in the Middle Ages. Notre Dame was vandalized in the French Revolution. Zealots cut the heads of statues of saints. The whole building was slated for destruction, and its stones were put up for auction. But the Revolution’s leaders finally decided that atheism was counter-revolutionary. They remembered the 18th century wit Voltaire’s quip, “If God didn’t exist, we would have to invent him.” Whether he exists or not, France’s past does, and it’s too glorious to destroy. Maybe its allure brought the extremists to their senses. 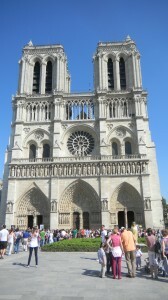 When I attended Mass in Paris Notre Dame, I was lucky enough to be able to sit in the first row. The light emanating from the transepts’ stained glass windows mixed with the choir’s singing and the aroma of incense. These spiritualized waves were framed by this mighty building. The experience was very sweet and sublime at the same time. One of Paris’ most enduring buildings fuses Heaven and Earth. Modern Paris does this pretty well too–in some cooler ways than you might expect.